Rise of Fire is the second book in the Reign of Shadows duology by the awesome Sophie Jordan. I read Reign of Shadows last year, and I've been really curious to see what's going to happen next. I love Sophie's books, so I was really looking forward to starting this one. I was super excited to get back into this story to see what was going to happen next for Luna and Fowler, especially after that cliffhanger ending in Reign of Shadows. I really love these two characters. Luna proves over and over again throughout this series that she can take care of herself, and I love that about her, as well her caring heart. I also love Fowler's fierce need to protect Luna, even when she doesn't seem to need it. They are really a great pair. We don't see many of the secondary characters from the first book in this sequel, but we are introduced to quite a few new ones as the story goes along; a few that you will love, and more than a few that you will come to hate. The storyline for the book follows the same arc as the first book, but the setting very different. In the first book, Luna and Fowler where in The Outside most of the time, and this time, they were in a castle for most of the book. To be completely honest, I really missed the outside world, though the dwellers, not so much. I didn't know when I started this second book that the series was a duology, so I was quite surprised when things started wrapping up at the end, which was nicely done. 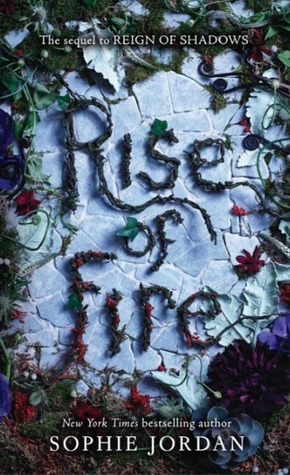 Overall; Rise of Fire was an nice sequel and conclusion for the Reign of Shadows duology! As I mentioned above, I wasn't aware that this series was a duology, so I'm a little bummed that there won't be a third book. I've really enjoyed reading these books, and I hate to see them end!